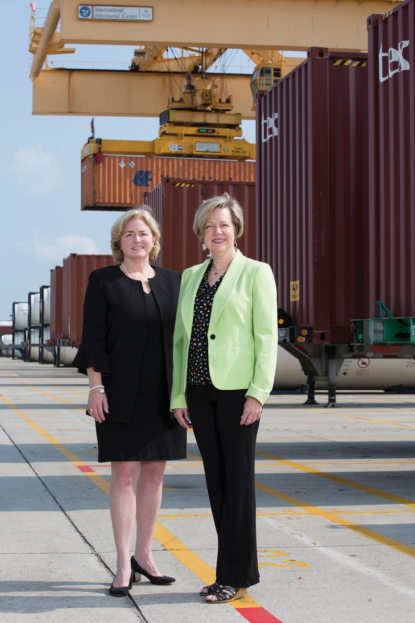 Amanda Berkey, Sr. International Trade Specialist, Madison County Commission/NAITA, and Anne Burkett, NAITA Executive Director and Director of Planning & Economic Development for the Madison County Commission, strive to facilitate trade across the North Alabama region. Photo taken at the Port of Huntsville’s International Intermodal Center by Dennis Keim for Business Alabama. “In 1983, farmland still covered much of North Alabama, but a group of visionary businesspeople knew it wouldn’t always be that way. The Huntsville economy nosedived after NASA’s Apollo program closed in the 1970s, and local business leaders knew the city needed to look beyond the federal government to keep their city thriving. Under the direction of the Madison County Commission’s International Trade Development Center, a small group formed the North Alabama International Trade Association (NAITA) to provide a forum to discuss and learn about business opportunities in the global marketplace. In celebration of its 35th Anniversary, NAITA has been featured in the August 2018 Issue of Business Alabama, a portion of which is highlighted in the excerpt above. This special supplement includes NAITA’s history, work, and impact on the North Alabama international business community. As the supplement mentions, North Alabama has transformed since 1983, and NAITA has worked alongside the businesses and organizations of the community to foster a healthy relationship with the global marketplace for over three decades. As NAITA surpasses this milestone, there are many ways to celebrate. We will continue to highlight NAITA’s history by sharing the supplement and using our 35th anniversary logo. In recognition of our anniversary, NAITA will also start an International Trade Blog and continue to profile North Alabama businesses each month through our Faces of Trade Series. A special thanks to Business Alabama and the supporters of the NAITA Special Supplement.